Shanghai is a city of immigrants and the most international of Chinese cities. This mixture of people and cultures means that there is an opportunity to try many different types of food from lowbrow to high-society. We arrived in Shanghai armed with a list of recommended restaurants and were hosted by people who had their own “must try” lists, so we had more places to eat than we had meals! I’m combining a few different meals into this entry. Breakfast is the most important meal of the day, right? Knowing that, we wanted to see how folks in Shanghai fuel their day. The morning that we arrived, Tawn’s cousins Paul and Nicha took us to a Kiwi restaurant near their apartment for a satisfyingly typical western style breakfast. On subsequent mornings, though, we went native for our breakfasts. A common breakfast dish anywhere with Chinese influence: rice porridge, known as jok (“joke”) or congee (“con-jee”). For breakfast, you can also order these “Chinese donuts” which are fried sticks of dough perfect for tearing up and adding to your jok. They are not sweet, though. If you are a porridge sort of person, as I am, you will probably enjoy jok. 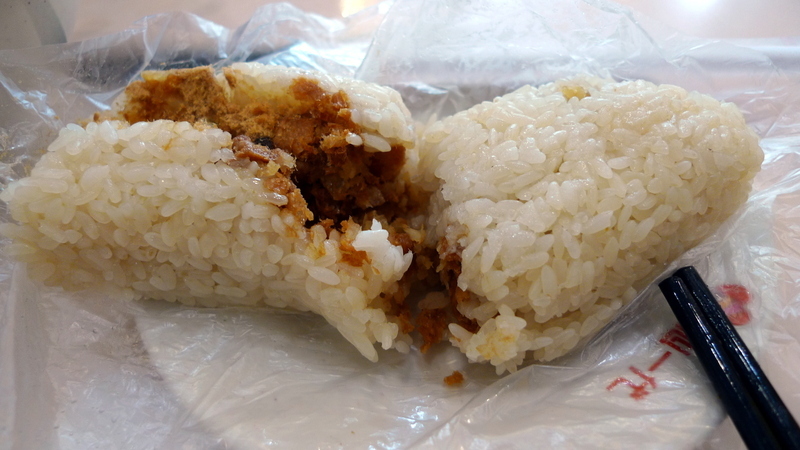 Another breakfast snack was what might be described as a rice burrito. Sticky rice rolled around some dried pork and pickled vegetables. This is the exact same thing we had for breakfast when we were in Taipei in November 2009. Another breakfast item, bought from a Muslim vendor, was this roti – a thin, multi-layered pancake with salt, green onions, and a sprinkle of sesame seeds. Tasty but heavy. 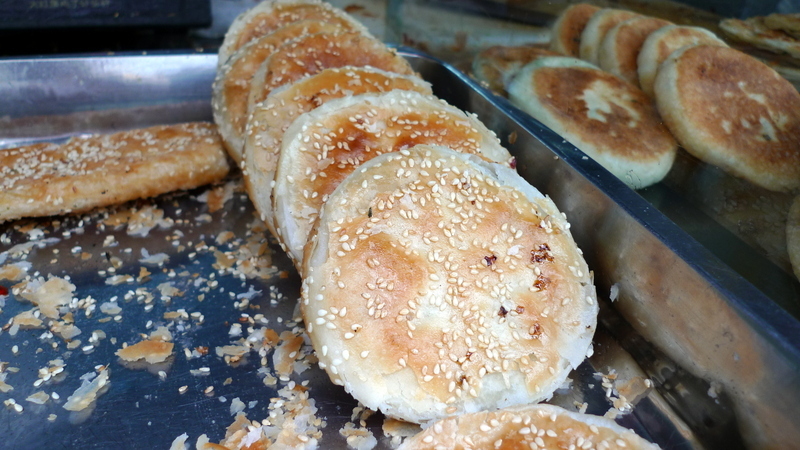 At the same vendor, we sampled these thin cakes stuffed with black sesame paste. The cakes are griddled and have a very flaky texture. 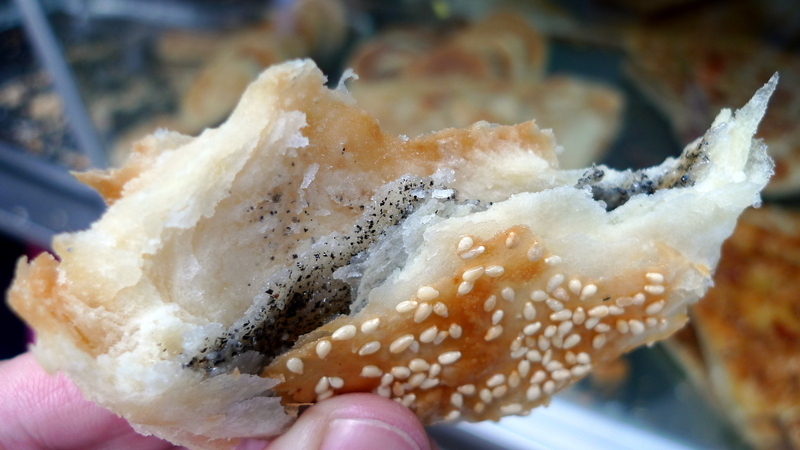 Detail shot showing the light, flaky texture of the cakes and the black sesame filling, which is slightly sweet. 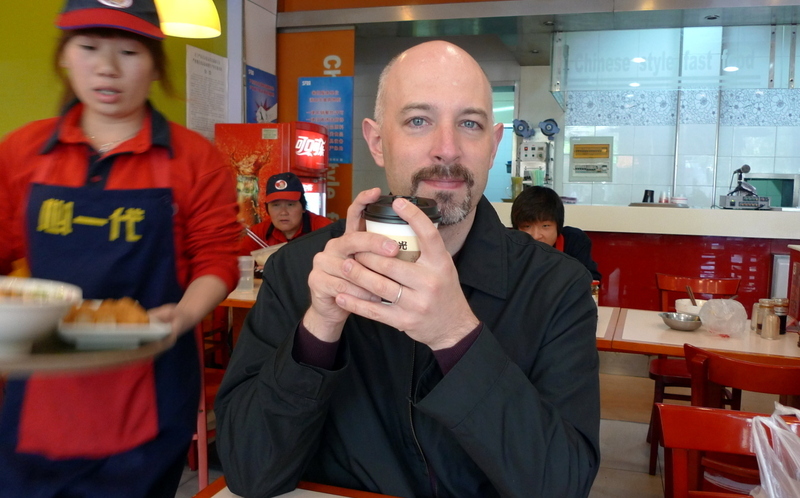 We also bought a hot beverage that was made from blended black sesame seeds. It had a very pleasant flavor. 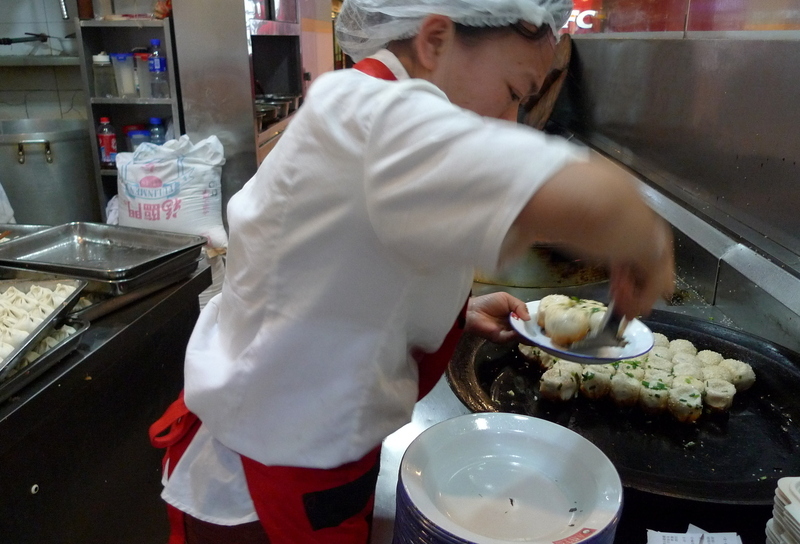 Shanghai is known for its dumplings and everyone has their favorite type of dumplings and their favorite vendors. 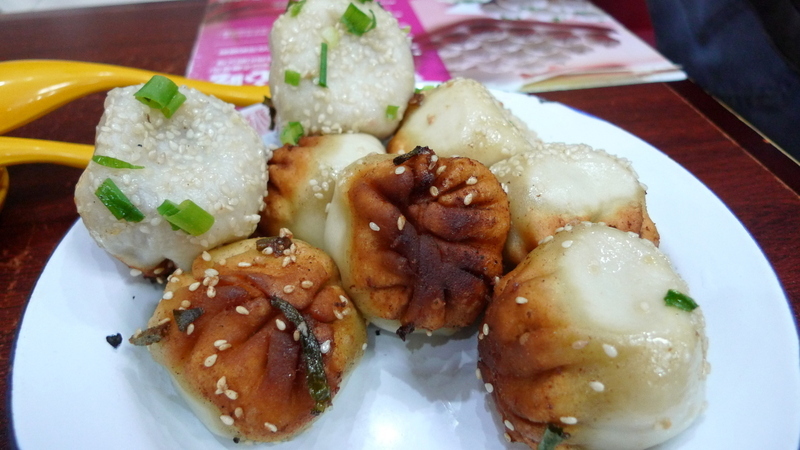 On this trip, I fell in love with sheng jian bao – a pan-fried pork soup filled dumpling sprinkled with sesame seeds. We tried sheng jian bao from a few different places but kept returning to the place where we first tried them: Yang’s Dumplings. With a few branches in Shanghai, Yang’s popularity is clear by the queue that stretches from the front door most anytime during the day. You queue up on the left, ordering and paying at the cashier, and then queue up on the right to wait to collect your order. 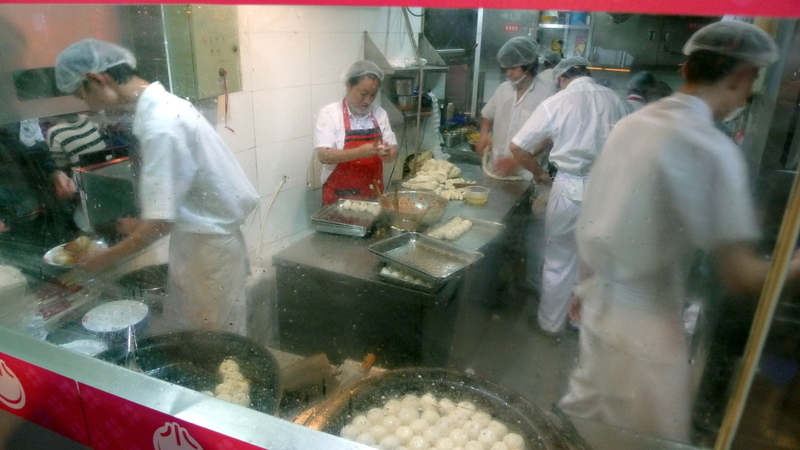 A view of the cramped but efficient kitchen at Yang’s Dumplings on Wujiang Luu above the West Nanjing Street subway station. The menu has only about a dozen items but these dumplings are the superstar item. The secret that makes sheng jian bao different from xiao long bao (made popular at places like Din Tai Fung restaurant) is that the sheng jian are fried in a heavy pan and steamed at the same time, a process making them a relative of Japanese gyoza – potstickers. This provides a crispy, crunchy bottom with a tender, steamed top – the perfect combination of textures. An order is four dumplings, enough for a hungry person or for two people to share if you have also ordered some soup or greens. 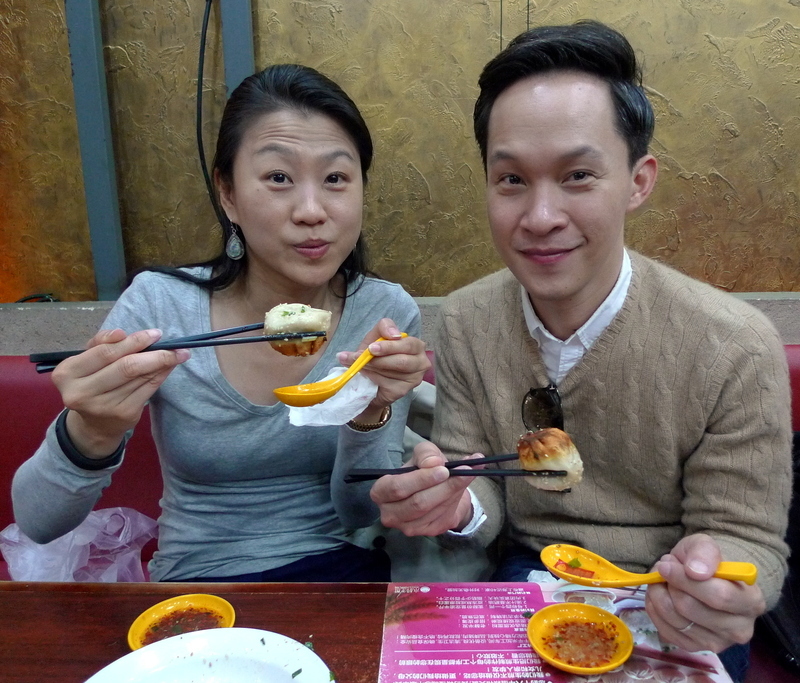 Tawn and his cousin’s wife, Nicha, demonstrate two techniques for eating sheng jian bao: steamed top up or pan fried bottom up. The trick here is to be very careful because the inside of the dumpling is filled with ground pork and a minor ocean of hot soup. You don’t want to let the succulent soup spill so you have to gently tear the top of the dumpling and slurp the soup out. I found the “steamed top up” technique to be easier. The sad circumstance that we kept facing throughout our visit to Shanghai was this: an empty bowl, its tasty contents just a fading flavor on our tongues. This entry was posted in Uncategorized and tagged bao, breakfast, China, Dining, dumpling, food, lunch, Shanghai, shengjian, travel by christao408. Bookmark the permalink. Sounds like you both had a wonderful time making your taste buds happy. It all looks so good. Wonderful photos and Ty for taking u all along with you through your photos. I have tasted most of those dishes at a restaurant or two here. Not sure I want that breakfast every morning but it does get me going lol. I freaking love those juicy buns. That is what they call them in Philly. MMMmmm Congeee is also in Korea I believe since I first heard about it on a Korean drama.I tried to make it once and wasn’t impressed so I want to try one made by a person who knows sometime. Those foods look amazing. Plus to eat it in its natural environment, Priceless. Ahhh fooooodddd!! You’re making me hungry again, Chris!I love having “jok” for breakfast. It’s a common breakfast in Burma too. We believe that it’s the best food for our early empty tummy. Darn you chris, now i’m hungry! Thanks! 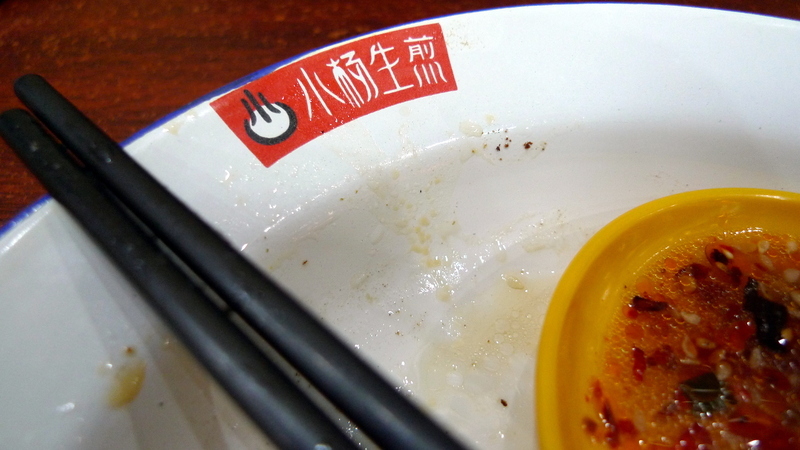 I think you might have gone to a Taiwanese place for breakfast…Sheng jian literally means “raw fried”. I made the mistake of taking a large bite into it the first time and scorched my chin. @Wangium – Well, if we were at a Taiwanese place, that would explain why the food was similar to what we had eaten in Taiwan, huh? (scratches head…)@I_love_Burma – Or oatmeal… but that’s just my Scot and Irish roots showing. @CurryPuffy – Agreed. Means a lot to have your support on this matter, though! @LostSock21 – Bwaa-haa-haaa! My plan has worked…@secade – @slmret – And delicious they were…@Grannys_Place – Always a pleasure to share my adventures. Thanks for your comment. @Ikwa – I’ve never gone to the trouble of making congee as the recipe looks like it takes a lot of time and effort. There are rice makers from Japan, though, that will cook the rice until it turns into congee. Maybe I should just get one of those. I love congee. J and I had it for lunch this past weekend. Those dumplings look amazing – I’ve never tried them before. I’m going to have to see if I can find them in Toronto. @ElusiveWords – If you can find them, eat a few for me! @murisopsis – There are worse things of which to dream…@Inciteful – Ha ha! Ha, i’ve actually been to that exact Yang’s Place for dinner! Right behind a Uniqlo. Yum. Never been to Shanghai, but the food looks yummy. Reminds me of some of the food we can eat here in CA. Come back to visit! We can take you and you can compare. @ungrandvoyage – Exactomundo. @swcheng15 – California is blessed with so much good food from so many places, one of the benefits of decades of immigration. I look forward to my next visit. This all looks delicious! 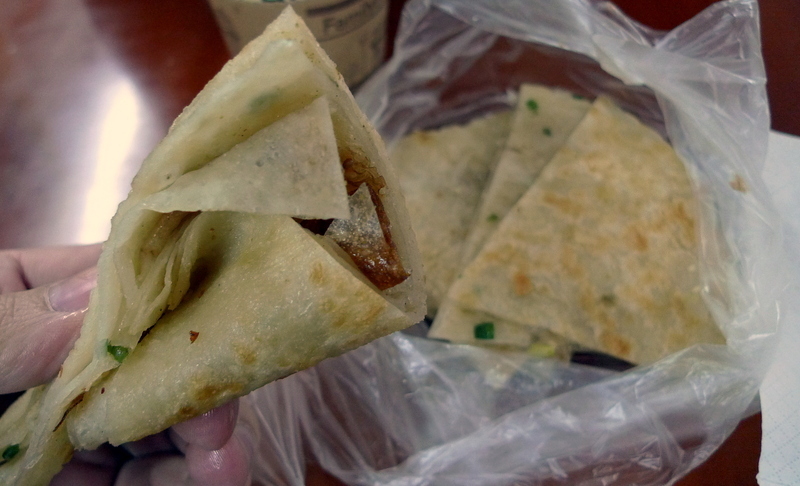 On my very first trip to Shanghai we had the sticky rice wraps from a local street vendor for breakfast. We had to get up super early because they’d sell out before 8am and close up shop! Can’t wait to see more of your photos from your trip =). Empty plate seems like the worst. I’ve always found it interesting the infinite various on flaky dough that humanity has invented. It’s hard to go wrong I guess. All the dishes look delicious!